Comments: 1 week after buying this book, I gifted 7 copies to friends and family and 2 others bought copies thanks to me raving about it. The best thing about this book is it’s simplicity and the fact that the book’s learnings can be synthesized into 1 key concept – The Choice Map – THAT is genius! 1. We are the questions we ask ourselves. And it is only by changing our questions can we change anything. 3. At every moment, we have a choice between being a ‘learner’ or being a ‘judger’. A learner asks questions like ‘what can I do to improve the situation? What can I learn from this?’ while a judger asks questions like ‘Why are things so bad? Why am I so bad?’ leading us down a negative path. The single most powerful idea for me from the book is that every time we feel negative (i.e. 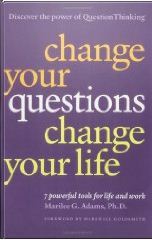 low energy, upset, angry, jealous etc etc), it is likely because we are asking ourselves ‘judger’ questions. (See The Choice Map) And the moment we catch ourselves feeling negative, we have the power to switch, ask ourselves learner questions and get positive! So glad to hear, Brittany.